Warner Bros. announced on Thursday that it will release the film adaptation of Lin-Manuel Miranda’s Tony-winning musical “In The Heights” on June 26, 2020. The announcement comes two weeks after Warner Bros. won an intense bidding war to pick up the rights to the musical after Miranda reclaimed them from The Weinstein Company in the wake of the Harvey Weinstein scandal and the studio’s bankruptcy. The rights were originally picked up by Universal, but were dropped in 2011 after the studio was reportedly reluctant to produce the film at a $37 million budget. They were then passed to TWC with plans to make the film on a $15 million budget. But after news broke of Harvey Weinstein’s history of sexual harassment and assault and TWC fell into financial collapse, the rights went back to Miranda and co-creator Quiara Alegría Hudes. Now, with Miranda’s clout bigger than ever following the success of “Hamilton” and movie musicals making a comeback after the success of “La La Land” and “The Greatest Showman,” “In The Heights” became the most lucrative property from the TWC sell-off, with the summer release showing that Warner Bros. plans to push the film as a four-quadrant event film. Currently, the June 2020 release slate also includes to-be-determined release slots for a Disney/Pixar film and a Fox/Marvel blockbuster. WB bought the rights for a reported $50 million after Hudes presented the script to several studios, including Fox, Paramount, Sony, Disney, Netflix and Apple. Jon M. Chu direct the project with Miranda producing with Anthony Bregman and Mara Jacobs. No castings have been announced yet, but Miranda will not play the lead role as he did on Broadway as he has aged out of the role. First premiering in New York in 2005 with a Broadway launch three years later, “In The Heights” follows the lives of several residents in the primarily Hispanic New York neighborhood known as Washington Heights. 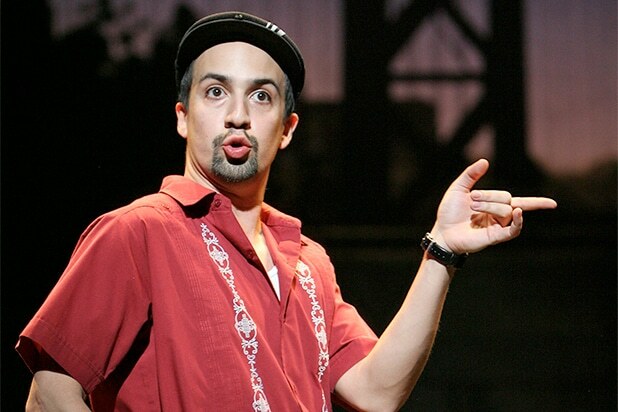 Miranda played the show’s narrator, Usnavi de la Vega, the owner of a small bodega in the Heights who longs to escape the neighborhood and move to the Dominican Republic with his crush, Vanessa. The film won four Tonys, including Best Musical, as well as a Grammy and a Pulitzer Prize. This isn’t the first time WB has picked up a film formerly attached to The Weinstein Company. TWC also held the North American distribution rights to “Paddington 2,” but sold it to Warner Bros. in November to maintain financial solvency. Warner Bros. will also release Chu’s next film, “Crazy Rich Asians,” on August 15 later this year.